Born at the stroke of midnight, at the precise moment of India's independence, Saleem Sinai is destined from birth to be special. For he is one of 1,001 children born in the midnight hour, children who all have special gifts, children with whom Saleem is telepathically linked. But there has been a terrible mix up at birth, and Saleem’s life takes some unexpected twists and turns. As he grows up amidst a whirlwind of triumphs and disasters, Saleem must learn the ominous consequences of his gift, for the course of his life is inseparably linked to that of his motherland, and his every act is mirrored and magnified in the events that shape the newborn nation of India. It is a great gift, and a terrible burden. In an unheard of turn of events, it has taken me exactly four weeks to conquer this novel. Four weeks of both loving and hating the narrative, four weeks of exciting fantastical turns, and four weeks of insipid political discourse. If I were to be asked if I liked this novel, I wouldn't have a straight answer to give. Our narrator, and head of the Midnight's Children Conference, Saleem Sinai, makes his excuses for the narrative early on the novel. He explains his life is dwindling, and there will be no time for edits or revisions before he crumbles into dust. As a result, his story veers, bucks, foreshadows, and circumvents more and more as it continues; he even comments on his awareness that the story was far easier to follow in the early stages. His digressions are vexing, but entirely human; he begins to tell us something before abruptly announcing that the story must be told in correct chronological order. This is absolutely infuriating, but the excuse of the rip tear crack is a difficult one to argue with. Despite Saleem's apparent intent to baffle and irritate his readers, his commentary on the susceptibilities of India and its residents are as delicious as (I can only imagine) the glorious foods he describes with such delicacy. He delves into the complex lives of his family and their secrets, explores their relationships with religion, and highlights many of the sacred and profane happenings in both his life and country over the span of thirty one years. Rushdie's language is beautiful, and his descriptions of India's colours, sounds, smells, and tastes had me awed. I particularly enjoyed the use of Padma as a grounding tool, listening to Saleem's story and interrupting where she felt the need of further explanation, or an impatience to get back on track. In terms of the political aspects, however, I was entirely ignorant. Having little to no knowledge of the dissent and conflict experienced, I was drawn in, although admittedly confounded, by the events described. I feel I could have appreciated the novel far more had I been more intelligent than even I pretend to be. 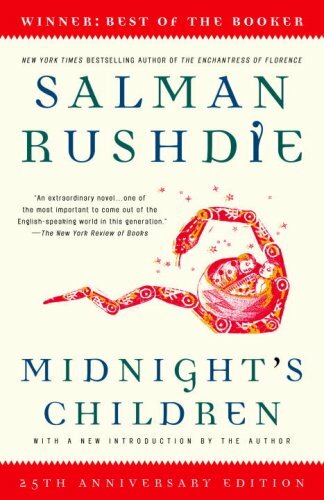 This is a long slog, but definitely worthwhile for Rushdie's social commentary, family intricacies and strong use of recurring symbols. I'm glad I've invested my four weeks of reading, but it wouldn't be truthful to say I wasn't glad it was over.